Two programs with thousands of wins and dozens of NBA players between them. A pair of history-ladened clubs meet in a historic NCAA Tournament Championship game tonight, as the top-ranked and top-seeded University of Kentucky Wildcats, led by college basketball’s best player Anthony Davis, square off against the Kansas Jayhawks, who are led by the only consensus All-American selection, Thomas Robinson. Kansas versus my beloved Kentucky for all the college basketball marbles? You know I’m in. Kentucky and Kansas are two of the most decorated programs in the history of college basketball, and they are intimately connected. James A. Naismith invented the game of basketball, and he ended up being the coach at Kansas. Working closely with him and his replacement Phog Allen? Adolph Rupp, Kentucky’s legendary coach and one of the best college coaches of all time. 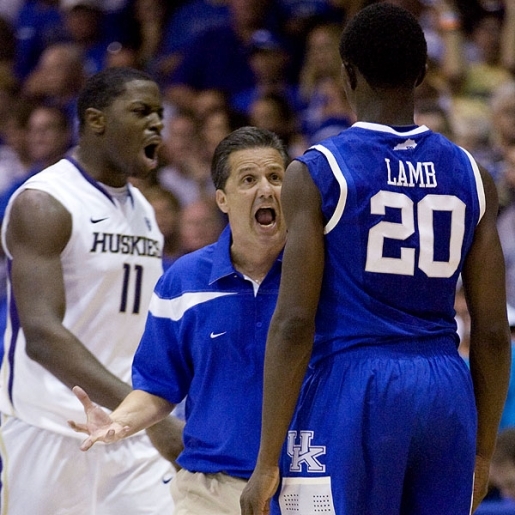 In more modern times, UK coach John Calipari got his start as a volunteer assistant at, you guessed it, Kansas! Kansas has only three national championships (the last in 2008) and Kentucky has seven (the last in 1998). Either Bill Self ends up with a fresh ring, or John Calipari wins his first and gets the monkey off his back.